Are you getting the most out of your growing investment? 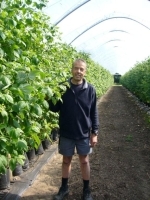 Soft fruit requires careful irrigation management to optimise fruit yields and quality. Poorly scheduled irrigation can drastically restrict root development, limit fruit production and increase disease levels. How often do you irrigate? Many of our growers have found they can reduce water and fertiliser use and still maintain yield and quality by gradually reducing irrigation frequency. 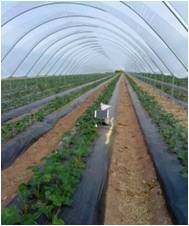 At present we monitor strawberries, raspberries, blueberries and more in both soil and substrate production systems. "Irrigation scheduling tools have been used to deliver water saving while maintaining yields of Class 1 fruit. After two seasons of trials at East Malling Research, results from this LINK project with HDC funding suggest that water inputs can be reduced by a staggering 70 per cent when some form of irrigation monitoring was employed compared with current "best practice". Less water leads to sweeter berries - BRIX increased from 8.2 to 9.2 when irrigation was scheduled and the vitamin C content was enhanced, therefore benefiting consumers. Project leader Dr Mark Else points out that the luxury watering regimes still used by many growers lead to excessive vegetative growth, increased disease, a reduced fruit shelf-life (less antioxidants, particularly vitamin C to help preserve the fruit) and increased waste. SF 83 will be widened to on-farm trials from next season and aims to help strawberry growers increase water-use efficiency by 40 per cent. This will enable them not only to save money but also to demonstrate efficient use of available water before time-limited abstraction licences for trickle irrigation are renewed following the new legislation to limit water use detailed in The Water Act 2003." Or as put by one of our long term clients..
"HDC have just completed work on strawberry irrigation, and have now discovered what YOU KNEW ALL ALONG. Dont over water beyond initial run off. How often do you have to tell people before they believe it? Unfortunately the article did not tell them to buy one of your sensors...."